Winsor McCay was an American comic cartoonist and animator. Winsor McCay lived from 1867 to 1934. He can be considered the true father of the cartoons we have watched and loved for over 100 years. Winsor McCay began illustrating newspapers and magazines in 1898. He began working for the New York Herald in 1903. He first created the comic strips Little Sammy Sneeze and Dreams of the Rarebit Fiend. Then in 1905 Winsor McCay began his most famous comic strip: Little Nemo in Slumberland. This was a fantasy in Art Nouveau style. It wonderfully showcased McCay’s strong graphic sense and mastery of color and linear perspective. Winsor McCay experimented with the formal elements of the comic strip page. He arranged and sized panels to increase impact and enhance elements of the narrative. Winsor McCay was an early animation pioneer. Between 1911 and 1921 McCay self-financed and animated ten films. 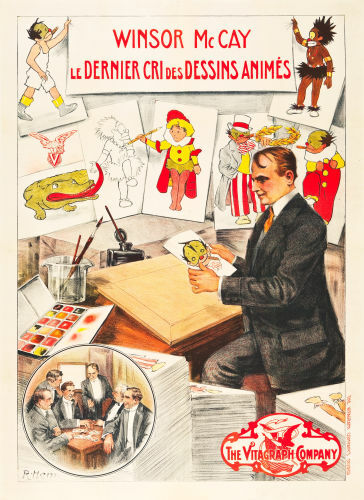 His first foray into animation was taken from his Little Nemo in Slumberland comic strip. James Stuart Blackton and Winsor McCay directed a ten-minute short film based on the comic strip, of which two minutes were animated. The film was first released on April 8, 1911. The first animated effort of McCay, it later achieved the status of an early animated classic. Its on screen title is Winsor McCay, the Famous Cartoonist of the N.Y. Herald and his Moving Comics. It is usually referred to as Little Nemo. This version was named to the National Film Registry in December 2009. The two animated minutes told a story and had known characters. While it is not the first piece of animated film, it can be considered the first real cartoon. This poster seen below is really the very first cartoon movie poster in history. Winsor McCay produced other cartoons including Gertie the Dinosaur in 1914 and The Sinking of the Lusitania in 1918. He inspired and influenced Walt Disney and most other animators for the next 100 years.